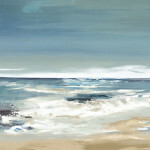 Canadian artist Valeria Mravyan has become finely attuned to the ever-changing regional light, nature, and the seasons. Mravyan says “It’s very important for me to express the feeling of an autumn afternoon or a peaceful, cold winter day.” While her gently abstracted paintings may depict a tree, a figure, or a house, these familiar motifs are rendered otherworldly by mysterious atmospheric effects. Like theatrical backdrops or scrims, her pictures convey what she describes as “…the illusion of something that is there, but not there.” Capturing the mutability of light and weather over the course of a day, her impressions of fresh clear morning light can segue into a golden, muted late-afternoon glow over burnished trees, sometimes before our eyes. A wistful air imbues certain scenes, especially those that are misty or clouded. Mravyan’s vision of the urban fabric is similarly romantic and harmonious. Her compositions feature softly angular forms and stylized buildings or landscapes built up from patches of colour. For example, her cityscapes feature mist-enshrouded ghostly high rises painted by scraping the pigment into ridged towers. Airily combining the middle-ground and far distance, the artist presents multiple perspectives of the same vista. Exercising artistic license, the exteriors of structures are at times juxtaposed with their interiors. Like a waking dream; they meld places seen, with places remembered.